This is a guide about removing double-sided tape from ceramic tile. Double-sided tape residue can be hard to remove. Here are some tips for removing double-sided tape from ceramic tile. How do I remove double-sided tape from ceramic tile? Use a plastic scraper to remove the outer sticky side of the tape and the middle part of the tape. There should only be "stickies" left. Use baby oil or vegetable oil and a scrub sponge. This will take up the stickies. 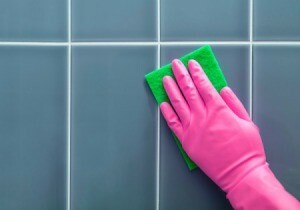 Then use an all-purpose cleaner (or whatever you normally use to clean your tile) to clean off the oil. Voila, should be good as new afterwards! You could also try Goo Gone. Lemon essential oil removes sticky residue from tile. Put a couple drops on a cotton ball and rub the double sided tape with it and it will come right up.